Washington Nationals outfielder and five-time All-star Bryce Harper just hit a 421-foot home run this past Saturday, giving his team a clean victory of 6-3 against the Chicago Cubs. This is an impressive comeback as Harper only recently got back in the game due to a knee injury. Impressive stuff. You can tell from the video that he’s still a bit in shock about the win. But Bryce Harper isn’t just a star baseball player. He’s a loving son, a husband, and a Mormon from Las Vegas. 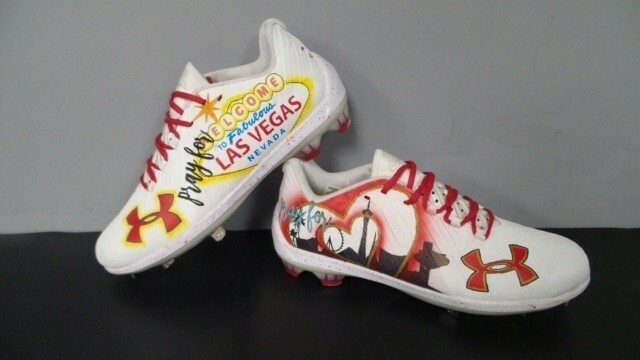 Harper wore these customized cleats (made by Under Armour and designed by SolesBySir) to his Friday game as a tribute the valuable lives lost in the recent mass shooting. The cleats sport the “Welcome to Fabulous Las Vegas, Nevada” logo, with the words “pray for” in front of the sign on one shoe. A heart and a skyline of the city with the words “pray for” are on the other shoe. As a Las Vegas native, his thoughts and prayers go out to those affected. Remember Vegas in your prayers.